Updated May 2, 2018, 1:50 p.m.
AppDynamics Manager for .Net Agent Extension works with the .Net Agent to capture and report metrics not gathered out of the box. It can be used to capture metrics such as: Windows Event Log data, current Windows Service states, Windows reboot times, or kick off custom scripts to gather metrics from any source. /Extensions- contains configuration data for each extension. 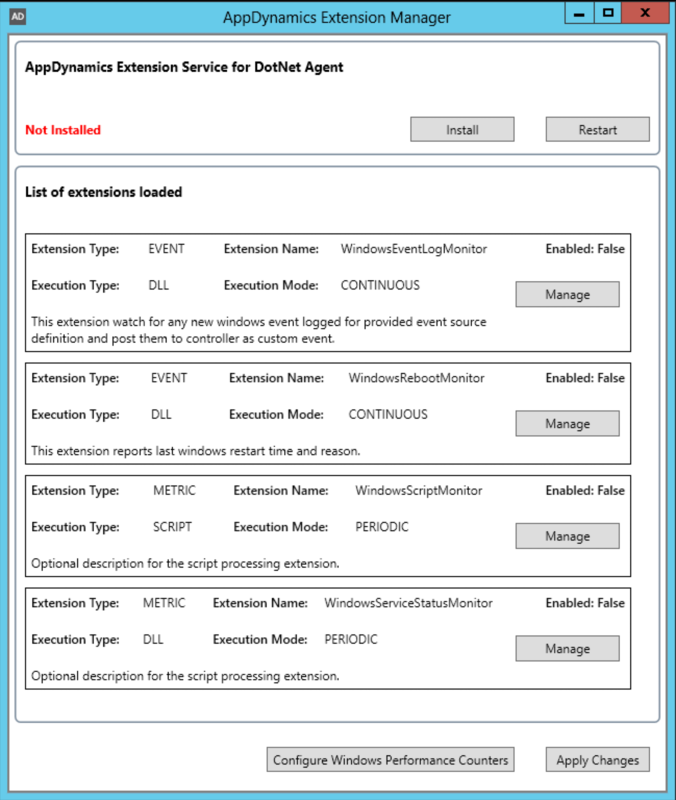 * AppDynamics.Extension.Manager.exe- The Extension Manager UI, use this to enable and configure extensions and to install/remove the AppDynamics.Agent.Extension Windows service. 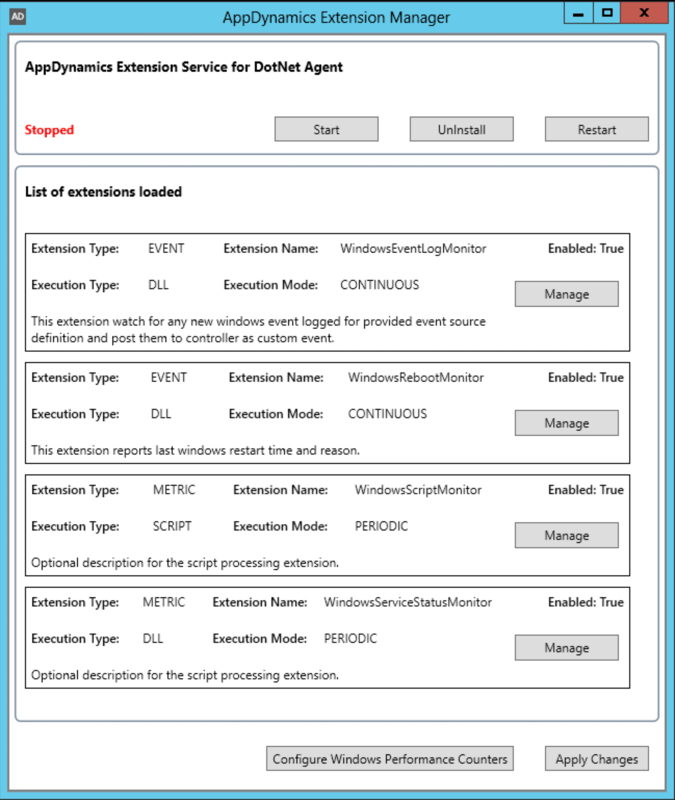 * ExtensionService.exe- The AppDynamics.Agent.Extension Windows service executable, a lightweight Windows service which continuously collects metric data for all .NET extensions and stores this data in Windows Performance Counters. These Performance Counters are polled continuously and their values are sent to the Controller by the AppDynamics.Agent.Coordinator service. * AppDynamics.Extension.CCT.exe- Configures which Windows Performance Counter metrics will be sent to the AppDynamics Controller via the AppDynamics.Agent.Coordinator Windows service. * ExtensionService.bat- Manages extension service without UI. This file can be used for unattended installation and managing of extension service. Once unzipped, you should see previously mentioned files and folders, along with other required configuration or library files. Event extensions - Event extensions are used to send custom Events to the controller.https://docs.appdynamics.com/display/PRO41/Monitor+Events. Application Infrastructure Performance - [Any Tier] - Custom Metrics - Performance Monitor - [Extensioin Name]. Additionally health rules can be created for these metrics to trigger Alerts when necessary. Some commonly used extensions have been bundled along with the Extension Manager. By default, all provided extensions are disabled.You can enable them by editing their corresponding XML configuration file. Please visit their respective extension pages for more details to enable. * Click the Install button to install the AppDynamics.Agent.Extension Windows service. * By defualt we dont have any extensions loaded. We need to create a new folder for any extension, under [Extension Manager]/Extensions directory. Extension folder must have valid extension.xml file in it. Once copied we should be able to see extension loaded upon relaunching extension manager ui. * Click the "Manage" button next to any extension to edit the XML configuration file located as/Extensions/[Extension Name]/extension.xml. Alternatively the XML editor of your choice can be used to edit and save these files. * Now click Start to start extension service. EVENT and METRIC extensions collect and send data to the controller differently. EVENT extensions make use of the AppDynamics Controller REST API and require controller user credentials to be added to their configuration file. METRIC extensions create Windows Performance Counters to store metric data until it's sent to the Controller via the AppDynamics.Agent.Coordinator service. In step #4 below, we'll add these Performance Counters to the AppDynamics.Agent.Coordinator configuration file (config.xml). Once you've updated the configuration for these extensions, you'll want to recycle the AppDynamics.Agent.Extension Windows Service for these changes to take effect. Note: it could take up to a minute for the service to stop. This time is necessary to terminate and clean all the resources effectively. If any METRIC extensions have been enabled, it will add all generated metrics to coordinator's configuration file (config.xml). We can use AppDynamics.Extension.CCT.exe to edit/remove the appropriate Performance Counters to the AppDynamics.Agent.Coordinator configuration file (config.xml). Restart the AppDynamics.Agent.Coordinator service for the changes made in config.xml to take effect. In a few minutes, you should start to see custom EVENT or METRIC data reported to the AppDymamics Controller. For EVENT extensions, you should see new custom events sent to the controller. https://docs.appdynamics.com/display/PRO41/Monitor+Events. For METRIC extensions, you can find the new metrics in the Metric Browser under Application Infrastructure Performance - [Any Tier] - Custom Metrics - Performance Monitor - [Extensioin Name]. To avoid using password in plain text, we can use encrypted passwords in extension.xml for any event type extensions. Default value for attribute encrypted is false. To use password in plain text, set the encrypted to false or remove the attribute. If you're not seeing metrics reported to the controller, check to make sure the custom Windows Performance Counters created by the Extension Service have been added to the AppDynamics.Agent.Coordinator configuration file (config.xml). If the Performance Counters have been added, try restarting the Coordinator to ensure the configuration has been picked up. If this doesn't help, check the Logs folder for any errors. Launch Appdynamics.Extension.Manager.exe from new installation and install extension service. Start Extension Service to use latest version. Support for custom location for config.xml file. Use of encrypted password for controller communication. Upgraded project to .NET 4.5. Improved and fixed issues with encryption. Improved logging for event based extension. Windows event properties (eventid, eventsource, machinename) are now part of controller properties. All Extensions published by AppDynamics are governed by the Apache License v2 and are excluded from the definition of covered software under any agreement between AppDynamics and the User governing AppDynamics Pro Edition, Test & Dev Edition, or any other Editions.